The Aquas cape 6-Watt LED Garden and Pond Spotlight provides beautiful lighting options ideal for use in ponds, waterfalls, gardens or the up-lighting of plants. This energy-efficient, compact light can be placed anywhere a spotlight is needed, and it can be used either in or out of the water. 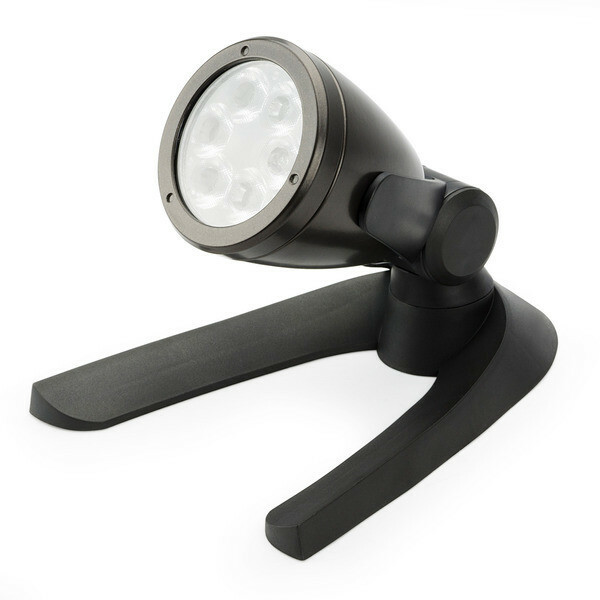 The Aquas cape 6-watt LED Spotlight is constructed of die-cast metal designed for years of use, and their quick connect fittings make for simple installation. Includes a removable mounting base can be wedged beneath large rocks or covered by gravel, ensuring the fixture maintains proper position beneath cascades. The 3000 Kelvin temperature will provide natural-looking white light that will completely transform the way your water feature looks at night. The fixture features 6 powerful LED diodes equivalent to a 50-watt halogen light. Aquas cape LED Spotlights are completely sealed from water and come with a limited 5-Year Full Replacement Warranty.